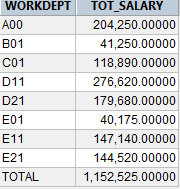 As you can see, the "grand-total" is represented by a NULL value in WORKDEPT. To have exactly the same result we got using the UNION clause, here is the trick : use of a COALESCE function around the WORKDEPT ! The major advantage of this feature is to simplify the SQL coding. But in terms of GETPAGE activity, with UNION the base table was read two times, one time for each subselect. While using GROUPING SETS, the table has only been read once. Feel free to send me your comments and ask questions.